Jacques René Chirac (November 29, 1932 - ) served as the President of France from May 17, 1995 until May 16, 2007. As President, he also served as an ex officio Co-Prince of Andorra and Grand Master of the French Légion d'honneur. After completing his studies of the DEA's degree at the Institut d'Études Politiques de Paris and the École Nationale d'Administration, Chirac began his career as a high-level civil servant, and soon entered politics. He subsequently occupied various senior positions, including Minister of Agriculture, Prime Minister, Mayor of Paris, and finally President of France. Chirac was the second-longest serving President of France (two full terms, first seven years and second five), behind François Mitterrand. He and his predecessor were also the only presidents to serve two full terms in the Élysée Palace. Chirac is the only person to have served twice as Prime Minister under the Fifth Republic. 6 First "Cohabitation" (1986–1988) and "desert crossing"
His internal policies included lower tax rates, the removal of price controls, strong punishment for crime and terrorism, and business privatization. He has also argued for more socially responsible economic policies, and was elected in 1995, after campaigning on a platform of healing the "social rift" (fracture sociale). His economic policies, based on dirigiste, state directed ideals, stood in opposition to the laissez-faire policies of the United Kingdom, which Chirac famously described as "Anglo-Saxon ultraliberalism." In 2003, he opposed the invasion of Iraq, threatening to use his veto in the United Nations. Subsequently, the United States-led invasion proceeded without an explicit UN mandate. Corruption allegations cloud his legacy, dating from his eighteen years as Mayor of Paris. His economic policies were not markedly successful, with unemployment rising during his term. His opposition to the war in Iraq, however, boosted his flagging popularity. Championing diplomacy, he also argued strongly that the UN, not the U.S. should take the lead in post-war nation building and reconstruction. Chirac, born in the Geoffroy Saint-Hilaire clinic (fifth district of Paris), is the son of Abel François Chirac (1893–1968), a company administrator, and Marie-Louise Valette (1902–1973), a housewife. Both families were of peasant stock—despite the fact his two grandfathers were teachers—from Sainte-Féréole in Corrèze. According to Chirac, his name "originates from the langue d'oc, that of the troubadours, therefore that of poetry." He is a Roman Catholic. Chirac was an only child (his elder sister, Jacqueline, died in infancy before his birth), and was educated in Paris at the Lycée Carnot and at the Lycée Louis-le-Grand. After his baccalauréat, he did a three month stint as a sailor on a coal-transporting ship. In 1956, he married Bernadette Chodron de Courcel, with whom he later had two daughters; Laurence (born March 4, 1958) and Claude (January 14, 1962). Claude Chirac has long worked as a public relations assistant and personal adviser, while Laurence, who suffered from anorexia nervosa in her youth, does not participate in the political activities of her father. Chirac is the grandfather of Martin Rey-Chirac by the relationship of Claude with French judoka Thierry Rey. Jacques and Bernadette Chirac have also a foster daughter, Anh Dao Traxel. Inspired by General Charles de Gaulle to enter public life, Chirac continued pursuing a civil service career in the 1950s. During this period, he joined the French Communist Party. He sold copies of L'Humanité, and took part in meetings of a communist cell. In 1950, he signed the Soviet-inspired Stockholm Appeal for the abolition of nuclear weapons—enough for him to be questioned when he applied for his first visa to the United States. In 1953, after graduating from Sciences Po, he attended Harvard University's summer school before entering the École Nationale d'Administration (ENA), the elite, competitive-entrance college that trains France's top civil servants, in 1957. Chirac trained as a reserve officer in armored cavalry at Saumur, from which he was ranked first among his year's students. He then volunteered for fighting in the Algerian War, using personal relations to be sent there despite the reservations of his superiors, who suspected him of Communism and did not want to make him an officer. After leaving ENA in 1959, he became a civil servant in the prestigious Court of Auditors and rose rapidly through the ranks. As early as April 1962, Chirac was appointed head of the personal staff of Prime Minister Georges Pompidou. This appointment launched Chirac's political career. Pompidou considered Chirac his protégé and referred to him as "my bulldozer" for his skill at getting things done. The nickname "Le Bulldozer" caught on in French political circles. Chirac still maintains this reputation. At Pompidou's suggestion, Chirac ran as a Gaullist for a seat in the National Assembly in 1967. He was elected deputy for Corrèze département, the place of his family's origin but a stronghold of the left. This surprising victory in the context of a Gaullist ebb permitted him to enter the government as state secretary (vice-minister) of social affairs. Although more of a "Pompidolian" than a "Gaullist," Chirac was well-situated in de Gaulle's entourage, being related by marriage to the general's sole companion at the time of the Appeal of June 18, 1940. In 1968, when student and worker strikes rocked France (see May 1968), Chirac played a central role in negotiating a truce. Then, as state secretary of economy (1968-1971), he had worked closely with Valéry Giscard d'Estaing, who headed the ministry of economy and finance. The young technocrat from ENA then rose to fame; Chirac was caricatured as the archetypal brilliant ENA graduate in an Asterix graphic novel. After some months in the ministry of relations with Parliament, Chirac's first high-level post came in 1972 when he became minister of agriculture and rural development under his mentor Georges Pompidou, who had been elected president in 1969. Chirac quickly earned a reputation as a champion of French farmers' interests. As minister of agriculture, Chirac first attracted international attention when he assailed U.S., West German, and European Commission agricultural policies that conflicted with French interests. On February 27, 1974, after the resignation of Raymond Marcellin, Chirac was appointed Minister of the Interior. On March 21, 1974, the SAFARI affair (a secret database containing personal information prepared under the responsibility of the ministry of the interior) was revealed by the newspaper Le Monde. From March 1974, he was entrusted by President Pompidou with preparations for the presidential election then scheduled for 1976. However, these elections were brought forward because of Pompidou's sudden death on April 2. Chirac wanted to rally Gaullists behind Prime minister Pierre Messmer, yet this was to be all in vain. Jacques Chaban-Delmas announced his candidacy, in spite of the disapproval of the "Pompidolians." Chirac and others published the Call of the 43 in favor of Giscard d'Estaing, the leader of the non-Gaullist part of the parliamentary majority. Giscard d'Estaing was elected as Pompidou's successor after France's most competitive election campaign in years. In return, the new president chose Chirac to lead the cabinet. When Giscard became president, he nominated Chirac as prime minister on 27 May 1974 in order to reconcile the "Giscardian" and "non-Giscardian" factions of the parliamentary majority. At the relatively young age of 41, Chirac stood out as the very model of the jeunes loups ("young wolves") of French political life. But he was faced with the hostility of the "Barons of Gaullism" who considered him a traitor for his role during the previous presidential campaign. In December 1974, he took the lead of the Gaullist party Union of Democrats for the Republic (UDR) against the will of its more senior personalities. As prime minister, Chirac quickly set about persuading the Gaullists that, despite the social reforms proposed by President Giscard, the basic tenets of Gaullism, such as national and European independence, would be retained. Chirac was advised by Pierre Juillet and Marie-France Garaud, two former advisers of Pompidou. These two organized the campaign against Chaban-Delmas in 1974. They advocated a clash with Giscard d'Estaing because they thought his policy bewildered the conservative electorate. Citing Giscard's unwillingness to give him authority, Chirac resigned as Prime Minister in 1976. He proceeded to build up his political base among France's several conservative parties, with a goal of reconstituting the Gaullist UDR into a neo-Gaullist group, the Rally for the Republic (RPR). As part of this deal, France sold Iraq the Osirak MTR nuclear reactor, a type designed to test nuclear materials. The Israeli Air Force later bombed the Osirak reactor, provoking considerable anger from French officials and the United Nations Security Council. The facility's intended use as a basis for nuclear weapons was confirmed after the 1991 Gulf War. The controversy took place in the years 2002-2003, when the United States decided to invade Iraq. France, with other western countries, led an effort to prevent such an invasion. The Osirak deal, made at a time when all western countries were doing business with Iraq, including and most notably the United States, was then used by the propaganda campaign led by a large part of the American media, favoring the Iraq invasion. Chirac supporters point out that, as mayor, he provided programs to help the elderly, people with disabilities, and single mothers, while providing incentives for businesses to stay in Paris. His opponents contend that he installed clientelist policies, and favored office buildings at the expense of housing, driving rents high and worsening the situation of workers. Chirac has been named in several cases of alleged corruption that occurred during his term as mayor, some of which have led to felony convictions of some politicians and aides. However, a controversial judicial decision in 1999 granted Chirac immunity while he was president of France. He refused to testify on these matters, arguing that it would be incompatible with his presidential functions. Investigations concerning the running of Paris's city hall, the number of whose municipal employees jumped by 25 percent from 1977 to 1995 (with 2000 out of approximately 35,000 coming from the Corrèze region where Chirac held his seat as deputy), as well as a lack of transparency concerning accounts of public sales (marchés publics) or of the communal debt, were thwarted by the legal impossibility of questioning him as president. The conditions of the privatization of the Parisian water network, acquired very cheaply by the Générale and the Lyonnaise des Eaux, then directed by Jérôme Monod, a close friend of Chirac, were also criticized. Furthermore, the satirical newspaper Le Canard enchaîné revealed the high amount of "food expenses" paid by the Parisian municipality (€15 million a year according to the Canard), expenses managed by Roger Romani (who allegedly destroyed all archives of the period 1978–1993 during night raids in 1999-2000). Thousands of people were invited each year to receptions in the Paris city hall, while many political, media and artistic personalities were hosted in private flats owned by the city. [[Image:chirac2.GIF|thumb|Chirac during the press conference of the closing down of the Renault factory in Vilvoorde (Belgium) in 1997 Chirac's immunity from prosecution ended when he left office and, in November 2007, a preliminary charge of misuse of public funds was filed against him. Chirac is said to be the first former French head of state to be formally placed under investigation for a crime. In 1978, he attacked the pro-European policy of Valéry Giscard d'Estaing (VGE), and made a nationalist turn with the December 1978 Call of Cochin, initiated by his counselors Marie-France Garaud and Pierre Juillet, which had first been called by Pompidou. Hospitalized in Cochin hospital after a crash, he then declared that "as always about the drooping of France, the pro-foreign party acts with its peaceable and reassuring voice." Furthermore, he appointed Ivan Blot, an intellectual who would join later, for some time, the National Front, as director of his campaigns for the 1979 European election. After the poor results of the election, Chirac broke with Garaud and Juillet. Nevertheless, the already-established rivalry with Giscard d'Estaing became even more intense. Although it has been often interpreted by historians as the struggle between two rivals French right-wing family, the Bonapartist one, represented by Chirac, and the Orleanist one, represented by VGE, both figures in fact were member of the Liberal, Orleanist tradition, according to historian Alain-Gérard Slama. But the eviction of the Gaullist Barons and of President VGE convinced Chirac to assume a strong neo-Gaullist stance. Chirac made his first run for president against Giscard d'Estaing in the 1981 election, thus splitting the centre-right vote. He was eliminated in the first round (18 percent) then, he reluctantly supported Giscard in the second round. He refused to give instructions to the RPR voters but said that he supported the incumbent president "in a private capacity," which was almost like a de facto support of the Socialist Party's (PS) candidate, François Mitterrand, who was elected by a broad majority. Giscard has always blamed Chirac for his defeat. He was told by Mitterrand, before his death, that the latter had dined with Chirac before the election. Chirac told the Socialist candidate that he wanted to "get rid of Giscard." In his memoirs, Giscard wrote that between the two rounds, he phoned the RPR headquarters. He passed himself off as a right-wing voter by changing his voice. The RPR employee advised him "certainly do not vote Giscard!" After 1981, the relationship between the two men became somewhat tense, with Giscard, even though he was in the same government coalition as Chirac, taking opportunities to criticize Chirac's actions. After the May 1981 presidential election, the right also lost the same year the legislative election. However, Giscard being knocked out, Chirac appeared as the leader of the right-wing opposition. Due to his protest against the economic policy of the Socialist government, he progressively aligned himself with the prevailing liberal opinions, even if these did not correspond with the Gaullist doctrine. While the far-right National Front grew, taking in particular advantage of a proportional representation electoral law, he signed an electoral platform with the Giscardian (and more or less Christian Democrat) party Union for French Democracy (UDF). When the RPR/UDF right-wing coalition won a slight majority in the National Assembly in the 1986 election, Mitterrand (PS) appointed Chirac prime minister (though many in Mitterrand's inner circle lobbied him to choose Jacques Chaban-Delmas instead). This power-sharing arrangement, known as cohabitation, gave Chirac the lead in domestic affairs. However, it is generally conceded that Mitterrand used the areas granted to the President of the Republic, or "reserved domains" of the Presidency, defense and foreign affairs, to belittle his Prime Minister. Chirac's cabinet sold a lot of public companies, renewing with the liberalization initiated under Laurent Fabius's Socialist government (1984-86—in particular with Fabius' privatization of the audiovisual sector, leading to the creation of Canal +), and abolished the solidarity tax on wealth (ISF), a symbolic tax on very high resources decided by Mitterrand's government. Elsewhere, the plan for university reform (plan Devaquet) caused a crisis in 1986 when a young man named Malik Oussekine was killed by the police, leading to huge demonstrations and the proposal's withdrawal. It has been said during other student crises that this event strongly affected Jacques Chirac, hereafter careful about possible police violence during such demonstrations (i.e. maybe explaining part of the decision to "promulgate without applying" the First Employment Contract (CPE) after large students demonstrations against it). One of his first act concerning foreign policies was to invite back to affairs Jacques Foccart (1913-1997), who had been de Gaulle's and his successors' leading counselor for African matters, called by journalist Stephen Smith the "father of all "networks" on the continent, at the time [in 1986] aged 72." Jacques Foccart, who had also co-founded the Gaullist Service d'Action Civique (SAC, dissolved by Mitterrand in 1982) along with Charles Pasqua, and who was a key component of the "Françafrique" system, was again called to the Elysée Palace when Chirac won the 1995 presidential election. Furthermore, confronted by anti-colonialist movements in New Caledonia, Prime minister Chirac ordered a military intervention against the separatists in the Ouvéa cave, leading to several tragic deaths. He allegedly refused any alliance with the National Front, the far-right party of Jean-Marie Le Pen. For the first time, his leadership over the RPR was challenged. Charles Pasqua and Philippe Séguin criticized his abandonment of Gaullist doctrines. On the right, a new generation of politicians, the "renovation men," accused Chirac and Giscard of being responsible for the electoral defeats. In 1992, convinced a man could not became President in advocating anti-European policies, he called to vote "yes" in the referendum on Maastricht Treaty, against the opinion of Pasqua, Séguin, and a majority of the RPR voters, who chosen the "no." Nevertheless, the right won the 1993 legislative election. Chirac announced that he did not want to come back as prime minister, suggesting the appointment of Edouard Balladur, who had promised that he would not run for the presidency against Chirac in 1995. However, benefiting from positive polls, Balladur decided to be a presidential candidate, with the support of a majority of right-wing politicians. Chirac broke at that time with a number of friends and allies, including Charles Pasqua, Nicolas Sarkozy, and so on, who supported Balladur's candidacy. A small group of "fidels" would remain with him, including Alain Juppé and Jean-Louis Debré. When Nicolas Sarkozy became President in 2007, Juppé was one of the only "chiraquiens" to serve in François Fillon's government. During the 1995 presidential campaign Chirac criticized the "sole thought" (pensée unique) represented by his challenger on the right and promised to reduce the "social fracture," placing himself more to the center and thus forcing Balladur to radicalize himself. Ultimately, he obtained more votes than Balladur in the first round (20.8 percent), and then defeated the Socialist candidate Lionel Jospin in the second round (52.6 percent). Shortly after taking office, Chirac, undaunted by international protests by environmental groups, insisted upon the resumption of nuclear tests at Mururoa Atoll in French Polynesia in 1995, a few months before signing the Comprehensive Test Ban Treaty. Reacting to criticism, Chirac pointed out that when France set out rearming itself in 1935, this attracted criticism but proved essential in the light of subsequent events. On February 1, 1996, Chirac announced that France had ended "once and for all" its nuclear testing, intending to accede to the Comprehensive Test Ban Treaty. Elected as President of the Republic, he refused to discuss the existence of French military bases in Africa, despite requests by the Ministry of Defense and the Quai d'Orsay (Ministry of Foreign Affairs). The French Army thus remained in Côte d'Ivoire as well as in Omar Bongo's Gabon. Cohabitation significantly weakened the power of Chirac's presidency. The French president, by a constitutional convention, only controls foreign and military policy— and even then, allocation of funding is under the control of Parliament and under the significant influence of the prime minister. Short of dissolving parliament and calling for new elections, the president was left with little power to influence public policy regarding crime, the economy, and public services. Chirac seized the occasion to periodically criticize Jospin's government. Nevertheless, his position was weakened by scandals about the financing of RPR by Paris municipality. In 2001, the left, represented by Bertrand Delanoë (PS), won over the majority in the town council of the capital. Jean Tiberi, Chirac's successor at the Paris town hall, was forced to resign after having been put under investigations in June 1999 on charges of trafic d'influences in the HLMs of Paris affairs (related to the illegal financing of the RPR). Tiberi was finally expelled from the RPR, Chirac's party, on October 12, 2000, declaring to the Figaro magazine on November 18, 2000: "Jacques Chirac is not my friend anymore." After the publication of the Méry video-tape by Le Monde on September 22, 2000, in which Jean-Claude Méry, in charge of the RPR's financing, directly accused Chirac of organizing the network, and of having been physically present on October 5, 1986, when Méry gave in cash 5 millions Francs, which came from companies who had benefited from state deals, to Michel Roussin, personal secretary (directeur de cabinet) of Chirac, Chirac refused to follow up his summons by judge Eric Halphen, and the highest echelons of the French justice declared that he could not been inculpated while in functions. During his two terms, he increased the Elysee Palace's total budget by 105 percent (currently €90 million, whereas 20 years ago it was the equivalent of €43.7 million). He doubled the number of presidential cars—nowadays there are 61 cars and seven scooters in the Palace's garage. He has hired 145 extra employees—the total number of the people he employed simultaneously was 963. He has spent €1 million per year on drinks purchased for guests visiting the Palace. As the Supreme Commander of the French armed forces, he has reduced the French military budget, as did his predecessor. It now accounts for three percent of GDP. In 1998, the aircraft carrier Clemenceau was decommissioned after 37 years of service, and another aircraft carrier was decommissioned two years later after 37 years of service, leaving the French Navy with no aircraft carrier until 2001, when Charles de Gaulle aircraft carrier was commissioned. He has also reduced expenditures on nuclear weapons and the French nuclear arsenal now includes 350 warheads, which can be compared to the Russian nuclear arsenal that consists of 16000 warheads. He has also published a plan which assumes reducing the number of fighters the French military has by 30. At the age of 69, Chirac faced his fourth presidential campaign in 2002. He was the first choice of fewer than one in five voters in the first round of voting of the presidential elections in April 2002. It had been expected that he would face incumbent prime minister Lionel Jospin (PS) in the second round of elections; instead, Chirac faced controversial far right politician Jean-Marie Le Pen of National Front (FN), and so won re-election by a landslide (82 percent); all parties outside the National Front (except for Lutte ouvrière) had called for opposing Le Pen, even if it meant voting for Chirac. Slogans such as "vote for the crook, not for the fascist" or "vote with a clothespin on your nose" appeared, while huge demonstrations marked the period between the two electoral rounds in all of France. Chirac became increasingly unpopular during his second term. According to a July 2005 poll, 32 percent judged Chirac favorably and 63 percent unfavorably. In 2006, The Economist wrote that Chirac "is the most unpopular occupant of the Elysée Palace in the fifth republic's history." As the left-wing Socialist Party was in thorough disarray following Jospin's defeat, Chirac reorganized politics on the right, establishing a new party—initially called the Union of the Presidential Majority, then the Union for a Popular Movement (UMP). The RPR had broken down; A number of members had formed Eurosceptic breakaways. While the Giscardian liberals of the Union of French Democracy (UDF) had moved to the right. The UMP won the parliamentary elections that followed the presidential poll with ease. During an official visit to Madagascar on July 21, 2005, Chirac described the repression of the 1947 Malagasy uprising, which left between 80,000 and 90,000 dead, as "unacceptable." 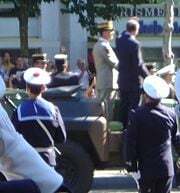 While Jacques Chirac was reviewing troops in a motorcade such as this one on Bastille Day 2002, he was shot at by a bystander. On July 14, 2002, during Bastille Day celebrations, Chirac survived an assassination attempt by a lone gunman with a rifle hidden in a guitar case. The would-be assassin fired a shot toward the presidential motorcade, before being overpowered by bystanders. The gunman, Maxime Brunerie, underwent psychiatric testing; the violent far-right group with which he was associated, Unité Radicale, was then administratively dissolved. On May 29, 2005, a referendum was held in France to decide whether the country should ratify the proposed treaty for a Constitution of the European Union (TCE). The result was a victory for the No campaign, with 55 percent of voters rejecting the treaty on a turnout of 69 percent, dealing a devastating blow to Chirac and the UMP party, as well as to part of the center-left which had supported the TCE. 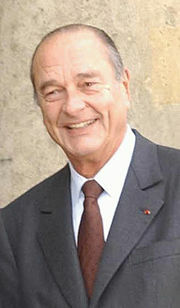 Along with Gerhard Schröder, Chirac emerged as a leading voice against the Bush administration's conduct towards Iraq. Despite intense U.S. pressure, Chirac threatened to veto, at that given point, a resolution in the UN Security Council that would authorize the use of military force to rid Iraq of alleged weapons of mass destruction, and rallied other governments to his position. "Iraq today does not represent an immediate threat that justifies an immediate war," Chirac said on March 18, 2003. Chirac was then the target of various American and British commentators supporting the decisions of Bush and Tony Blair. Current Prime minister Dominique de Villepin acquired much of his popularity for his speech against the war at the United Nations (UN). However, following controversies concerning the CIA's black sites and extraordinary rendition program, the press revealed that French special services had cooperated with Washington in the same time that Villepin was countering US foreign policy at the UN headquarters in New York. Chirac supported the UN's role in Iraq's reconstruction and nation building after the invasion, not the U.S.; "'We are no longer in an era where one or two countries can control the fate of another country,' Mr. Chirac said at a news conference in Paris after meeting with the United Nations' high commissioner for refugees." After Togo's leader Gnassingbé Eyadéma's death on February 5, 2005, Chirac gave him tribute and supported his son, Faure Gnassingbé, who has since succeeded to his father. On January 19, 2006, Chirac said that France was prepared to launch a nuclear strike against any country that sponsors a terrorist attack against French interests. He said his country's nuclear arsenal had been reconfigured to include the ability to make a tactical strike in retaliation for terrorism. [[Image:Bush and Chirac.jpg|thumb|Chirac and George W. Bush during the 27th G8 summit, July 21, 2001.]] In July 2006, the G8 met to discuss international energy concerns. Despite the rising awareness of global warming issues, the G8 focuses on "energy security" issues. Chirac continued to be the voice within the G8 summit meetings to support international action to curb global warming and climate change concerns. Chirac warned that "humanity is dancing on a volcano" and calls for serious action by the world's leading industrialized nations. Throughout his presidency, he tried to improve relations with former French colonies and possessions in Africa and also in the Middle East. One reason why he opposed the 2003 invasion of Iraq was because he knew that this would be unpopular in the region, where he wanted to France to be seen as a voice for reason and diplomacy. Following major students protests in spring 2006, which succeeded to civil unrest in autumn 2005 following the death of two young boys in Clichy-sous-Bois, one of the poorest French commune located in Paris' suburbs, Chirac retracted the proposed First Employment Contract (CPE) by "promulgating [it] without applying it," an unheard-of—and, some claim, illegal — move destined to appease the protests while giving the appearance not to retract himself, and therefore to continue his support towards his Prime Minister Dominique de Villepin. During April and May 2006, Chirac's administration was beset by a crisis as his chosen Prime Minister, Dominique de Villepin, was accused of asking Philippe Rondot, a top level French spy, for a secret investigation into the latter's chief political rival, Nicolas Sarkozy, in 2004. This matter has been called the second Clearstream Affair. On May 10, 2006, following a Cabinet meeting, Chirac made a rare television appearance to try to protect Villepin from the scandal and to debunk allegations that Chirac himself had set up a Japanese bank account containing 300 million francs in 1992 as Mayor of Paris. Chirac said that "The Republic is not a dictatorship of rumors, a dictatorship of calumny." In a pre-recorded television broadcast aired on March 11, 2007, Jacques Chirac announced, in a widely-predicted move, that he would not choose to seek a third term as France's President. "Serving France, and serving peace, is what I have committed my whole life to," Chirac said, adding that he would find new ways to serve France after leaving office. He did not explain the reasons for his decision. Chirac did not, during the broadcast, endorse any of the candidates running for election, but did devote several minutes of his talk to a plea against extremist politics that was considered a thinly-disguised invocation to voters not to vote for Jean-Marie Le Pen and a recommendation to Nicolas Sarkozy not to orient his campaign so as to include themes traditionally associated with Le Pen. After his presidency ended, Chirac became a lifetime member of the Constitutional Council of France. He sat for the first time in the Council on November 15, 2007, six months after leaving the French Presidency. Immediately after Sarkozy's victory, Chirac moved into a 180 square meters duplex on the Quai Voltaire in Paris lent to him by the family of former Lebanese Prime Minister Rafik Hariri. During the Didier Schuller affair, the latter accused Hariri of having participated to the illegal funding of the RPR's political campaigns, but the justice closed the case without further investigations. On April 11, 2008, Chirac's office announced that he had undergone successful surgery to fit a pacemaker. Because of Jacques Chirac's long career in visible government position, he has often been parodied or caricatured: Young Jacques Chirac is the basis of a character in an Astérix book: that of a young, dashing bureaucrat just out of the bureaucracy school, proposing methods to quell Gallic unrest to elderly, old-style Roman politicians. He was featured in Le Bêbête Show as an overexcited, jumpy character. Jacques Chirac is one favorite character of Les Guignols de l'Info, a satiric latex puppet show. He was once portrayed as a rather likeable, though overexcited, character; however, following the corruption allegations, he has been shown as a kind of dilettante and incompetent who pilfers public money and lies through his teeth. His character for a while developed a super hero alter ego, Super Menteur ("Super Liar"), in order to get him out of embarrassing situations. Because of his alleged improprieties, he was lambasted in a song ("Chirac in jail") by French punk band the Wampas, with a video clip made by the Guignols. "Croix de la Valeur Militaire"
Knight of the Order of Arts and Letters"
Knight of the "Mérite Sportif"
Chirac's failure to revive France's economy or to curb rising unemployment (which rose to ten percent), and corruption allegations, color his legacy. Internationally, though, he did much to maintain Frances' independent foreign and to improve relations with former French colonies and mandated territories. He refused to visit South Africa until apartheid was dismantled and shortly after his first election "acknowledged the responsibility of the French state during World War II in attending to the persecution of the Jewish populace and sought national forgiveness for it." Experts say that in foreign policy "Mr. Chirac will best be remembered for his strong opposition to the March 2003 U.S. invasion of Iraq." His greatest set-back "in the foreign policy realm came in 2005, when he was unable to convince the French to vote in favor of a constitution for Europe." His strong support the role of the United Nations came at a time when it was being increasingly side-lined in what some refer to as the unipolar era, that is, the age of a single super-power, the U.S. unlike the bi-polar Cold War dominated by two powers, the U.S. and the Soviet Union. The United Nations is not perfect but only cooperation and diplomacy between peoples will rid the world of war, enabling humanity to make earth a common home, not a shared grave. The UN is still best placed to facilitate cooperation, so it needs to be strengthened and reformed and not side-lined. ↑ John Laurenson, Letter from Paris-John Laurenson on Claude Chirac's crucial but understated electoral role, BBC. Retrieved November 23, 2008. ↑ Amir Taheri, The Chirac Doctrine: France’s Iraq-war plan, National Review Online. Retrieved November 23, 2008. ↑ Eric Aeschimann and Christophe Boltanski, Chirac d'Arabie: les mirages d'une politique française (Paris, FR: Grasset, 2006, ISBN2246691214), 64. ↑ Joshua Glenn, Rebuilding Iraq: Chirac's other Iraq policy, The Boston Globe. Retrieved November 23, 2008. ↑ John Lichfield, Chirac faces investigation into 'misuse of public cash, The Independent. Retrieved November 23, 2008. ↑ 6.0 6.1 Alain-Gérard Slama, Vous avez dit bonapartiste? L'Histoire 313 (2006): 60-63. ↑ 7.0 7.1 7.2 7.3 Stephen Smith, Naufrage de la Françafrique—Le président a poursuivi une politique privilégiant les hommes forts au pouvoir, L'Histoire 313: 70. ↑ Harry de Quetteville, Chirac labels 'racist' Le Pen as threat to nation's soul, The Age. Retrieved November 23, 2008. ↑ Rien ne va plus entre Chirac et Tiberi, Le Figaro, November 18, 2000. ↑ Suzanne Daley, Aide's Videotaped Confession Ties Chirac to Slush Fund, New York Times. Retrieved November 23, 2008. ↑ CIA World Factbook, Rank Order—Military expenditures—percent of GDP. Retrieved November 23, 2008. ↑ Net Marine, Porte-avions Charles de Gaulle. Retrieved November 23, 2008. ↑ Global Security, Nuclear Weapons—France Nuclear Forces. Retrieved November 23, 2008. ↑ Global Security, Worldwide Nuclear Forces. Retrieved November 23, 2008. ↑ Bloomberg, Chirac Popularity Plunges to Record Low, Poll Shows. Retrieved November 23, 2008. ↑ Economist, What France needs. Retrieved November 23, 2008. ↑ Eric Pfanner, France's §2.8 billion aid package unlikely to bring quick fix: Alstom bailout may be long haul, International Herald Tribune. Retrieved November 23, 2008. ↑ People Daily Online, People's Daily Online - France's Alstom, China ink $1.3b contracts. Retrieved November 23, 2008. ↑ BBC, Chirac escapes lone gunman's bullet. Retrieved November 23, 2008. ↑ BBC, US war signal divides world. Retrieved November 23, 2008. ↑ Michael Wines, A Nation at War: Diplomacy. Chirac to join German and Russian Leaders, New York Times. Retrieved November 23, 2008. ↑ Molly Moore, Chirac: Nuclear Response to Terrorism Is Possible, The Washington Post. Retrieved November 23, 2008. ↑ Cut CO2, Chirac is Not in Favor of Dancing on Volcanoes. Retrieved November 23, 2008. ↑ Times Online, French farce. Retrieved November 23, 2008. ↑ Times Online, Caught in deep water: Chirac swims against a tide of scandal. Retrieved November 23, 2008. ↑ International Herald Tribune, France's Chirac says he will not run for re-election. Retrieved November 23, 2008. ↑ John Leicester, Chirac Leaving Stage Admired and Scorned, The Washington Post. Retrieved November 23, 2008. ↑ BBC, France's Chirac gets pacemaker. Retrieved November 23, 2008. ↑ Stéphane Riviere, La caricature dans Astérix: Jacques Chirac. Retrieved November 23, 2008. ↑ Craig R. Whitney, Paris Journal; On Election Day, Puppets Could Steal the Show, New York Times. Retrieved November 23, 2008. ↑ Metro Lyrics, Chirac En Prison Les Wampas Lyrics. Retrieved November 23, 2008. ↑ 32.0 32.1 32.2 Andre de Nesnera, Chirac Leaves Mixed Legacy After 12 Years as French President, Voice of America. Retrieved November 23, 2008. Allport, Alan. 2007. Jacques Chirac. Modern World Leaders. New York, NY: Chelsea House. ISBN 9780791092651.
d'Estaing, Valéry Giscard. 2006. Le pouvoir et la vie. Paris, FR: Cie. 12, Diffusion Inter Forum. ISBN 9782903866280. Hecht, Emmanuel, and François Vey. 1995. Chirac de A à Z. Paris, FR: Michel. ISBN 9782226076649. Keeler, John T.S., and Martin Schain. 1996. Chirac's Challenge: Liberalization, Europeanization, and Malaise in France. New York, NY: St. Martin's Press. ISBN 9780312122706. Lepage, Frédéric, and Olivier Fauveaux. 1996. A table avec Chirac. Paris, FR: M. Lafon. ISBN 9782840982326. Tuppen, John N. 1991. Chirac's France, 1986-88: Contemporary Issues in French Society. New York, NY: St. Martin's Press. ISBN 9780312044893. Anne Applebaum, Farewell, Jacques Chirac, The Washington Post, May 8, 2007. This page was last modified on 13 March 2018, at 15:40.